Reports started to flow in over the weekend that the Galaxy Nexus on Verizon was experiencing signal strength issues and possibly dropping calls like a mutha. Can’t say that I have noticed the dropped call issue myself, but it does seem tough to ever get a full 4 bars of LTE on this puppy. I’m also not having to toggle in and out of airplane mode as much as some have claimed, but then again, I have had to a couple of times and that’s unfortunate. 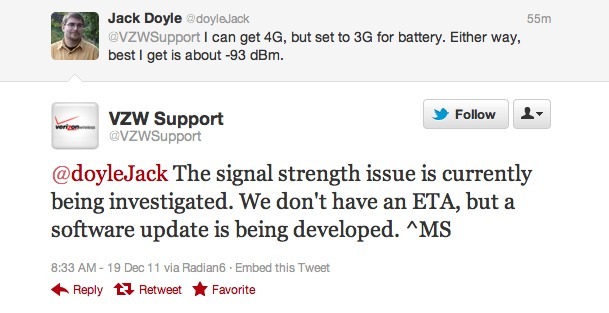 Some have locked onto the idea that the 4.0.2 update somehow broke signal strength – the jury is still out on that. So what is Verizon doing about it? There official Twitter support account claimed this morning that an investigation has started and that a software update “is being developed.” Wait, so that essentially says two things: that they aren’t sure yet and are looking into it or they already know the issue and are fixing it. Hmmm. Either way, the issue is on their radar and we could see something in no time, being a Nexus and all. How has your experience been? Bad signal and dropped calls? Neither? One or the other?